The Cooking Photographer: Samosa Tacos. Huh? We love potato and pea stuffed samosas here, but they’re a special occasion food because they take hours to prepare with all the stuffing, folding and frying. This is my way to enjoy our favorite samosa filling without the hassle. I still make real samosas occasionally, but now we eat them much more often as a quick weeknight meal. If you’re up for the extra prep, these “tacos” are even better with a little cucumber raita drizzled on top. If not, don’t worry about it, they’re excellent plain. 1. Peel and cube potatoes into a pot of cold water. Drain water once all the potatoes are sliced, and refill to 1 inch above potatoes with more cold water. Heavily salt the water and bring to a gentle boil until the potatoes pierce easily with a fork. 2. Drain potatoes well in a colander and place back in the pot. Turn on the stove to low and evaporate the liquid in the bottom of the pot and then turn off the heat. Add all the spices and olive oil and mash leaving some small chunks throughout. 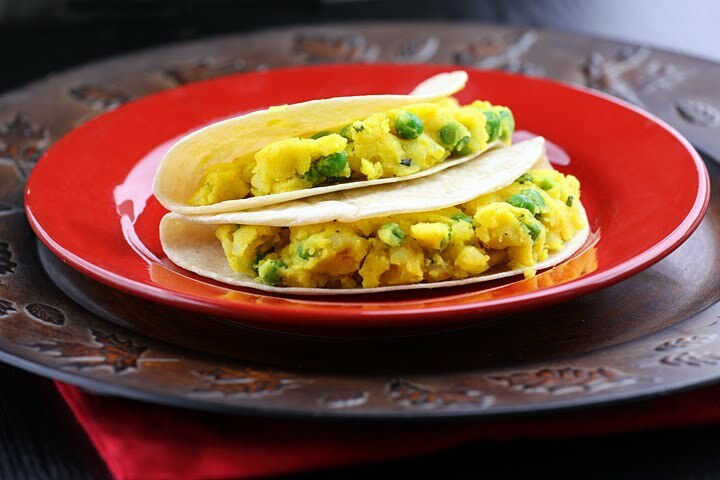 Stir in the frozen peas and cilantro and serve on tortillas. Now that's what I call cross-culturalism. And it sounds mighty tasty too. Way to go Laura. Ooh that's clever. Yum! I love samosa filling. What a clever idea! Instead of frying the dough, eat them like tacos. A lot healthier, I am sure. I love samosa fillings. I will have to try it your way. Yum! Why you clever little minx! Brilliant. Very cool veg meal. It's nice to see that I am not crazy! I made baked samosa flautas in March, as posted on my blog. And according to my Indian friend, her mother uses flour tortillas to make fried samosas as well. It's so much easier and healthier. That is a brilliant idea! I love Samosas, but am never willing to fry them. (For the 'crunch', I will just replace the soft Wheat Tortillas with crispy Corn Taco Shells) My next thought, as soon as I saw this: fusion-style Vada Pav!! This is a great idea. My husband is Indian, and his family serves rotli (much like a tortilla) at every meal, with various vegetable or potato dishes. They laughed when I immediately formed a taco from the rotli instead of tearing and scooping like the rest of them. "Eat it however you like, as long as you enjoy!" they told me. Mexican food is also a favorite of my husband, so when he saw your photo and caption on tastespotting he was hooked and wanted me to make it. I'm so happy your husband isn't too ashamed of this recipe to try it lol! I hope you both like this one. Just found you. Great pics! I do this, too, only, I brush the tortillas with a tiny bit of butter, and make them as you would a quesadilla. Oh man, Laura, this is brilliant! Love samosa filling but the work of folding them into filo is horrid! This is just brilliant or did I already say that? Must try! Very unique taco! Are samosas just the combo of ingredients? Never heard of them. Sure looks tasty though! Oh, this is so exciting, I've just written a post on the evolution and popularity of samosas, and now I just need to go in and link to this post, it fits perfectly. I love tacos and I love samosas, so this post is right up my alley!! Glad I could help Lori! I love samosas. I'm looking forward to your post! These were so good. Quick, creative, and delicious. Thank you so much. They make naan available in the bakery department of most grocery stores and while home-made is definitely much better, I cannot for the life of me manage to make a good naan. Anyhow getting to my point...I bet these would be fabulous In naan also!